NEW!!! 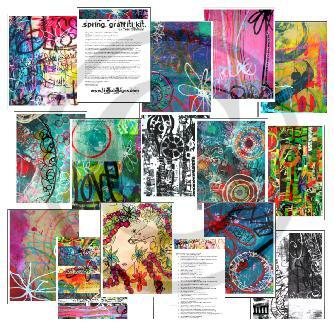 Digital printable art kits and collage sheets of mixed media artwork by Traci Bautista. Instantly download with a click of a button. This is a 8.5 x11" digital PDF printable. Print it out as many times as you'd like. Will print with any program that reads PDFs. 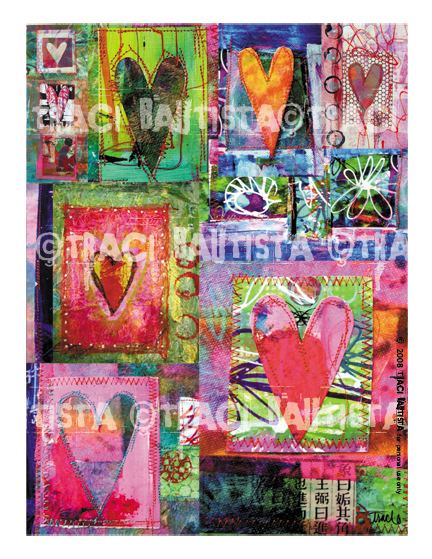 Hearts digital collage created from handmade mixed media paintings by Traci Bautista. Collage sheets are 8.5"x11" (high resolution 200 dpi) PDF. Once you download it...Print it on paper, inkjet fabric sheets, canvas, stickers, clear labels. It can be used as scrapbook paper, mixed media projects, image transfers, collage, art journal pages, or greeting cards...the possibilities are endless! 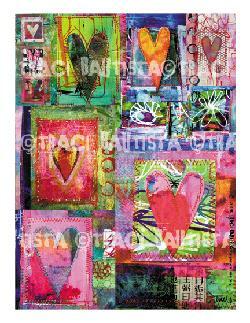 Collage sheets are all created from handmade mixed media paintings by Traci Bautista altered in Photoshop. 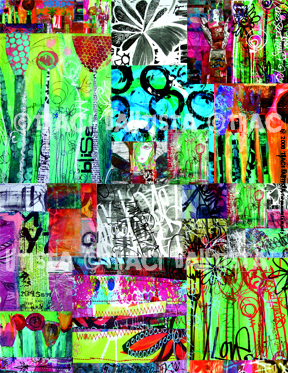 Collage sheet range in size up to 12"x12" jpeg (high resolution 150/300 dpi) image. Once payment is received, a link to download the collage sheet will be delivered via email to you within 24 hours. The link will be available for a limited time then downloads expire. Once you download it...Print it on paper, inkjet fabric sheets, canvas, stickers, clear labels. It can be used as a scrapbook paper background, journal pages, mixed media projects, image transfers, cut and collage on a frame, make a greeting card...the possibilities are endless! The original artwork is the copyright of Traci Bautista. All downloads by you (the User) from www.treicdesigns.com/ tracibautista.etsy.com/ kollaj.typepad.com are for PERSONAL USE ONLY and one-of-a-kind art pieces for sale. And under NO circumstances these images cannot be resold (as collage sheets, cut-up, digitally altered), printed for commercial use, distributed electronically or redistribution of any kind. Use of elements for mediums such as (but not limited to) personal websites, social networking sites such as Myspace/Facebook/Twitter and blogs are allowed as long as they do not serve a commercial, income generating purpose. If elements of files downloaded from our websites are used, please do credit us with my link and name: www.treicdesigns.com/Traci Bautista. Sample image is smaller, lower quality than original high resolution image. WATERMARK ONLY APPEARS ON SAMPLE, IT WILL NOT APPEAR ON COLLAGE SHEET. 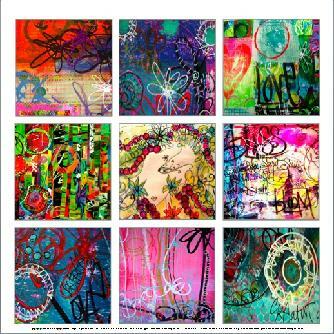 Collage sheet created from handmade mixed media paintings by Traci Bautista altered in Photoshop. Collage sheet is a 8.5"x11" jpeg (high res 300 dpi) image. Collage sheet created from handmade mixed media paintings by Traci Bautista altered in Photoshop. Collage sheet is a 12"x12" jpeg (high res 150 dpi) image. 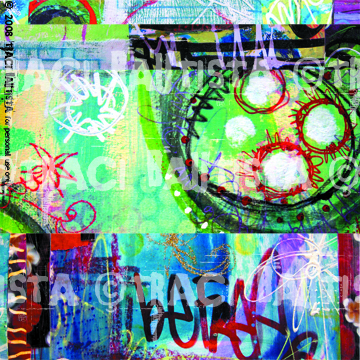 Collage sheet created from handmade mixed media paintings by Traci Bautista altered in Photoshop. Collage sheet is a 8.5"x11" jpeg (high res 150 dpi) image.